It’s not often I feel compelled to write about a customer service experience, but 1-800-Contacts is so far beyond any other company I’ve ever dealt with, I think they deserve some credit. Quick note: this all happened a couple months ago, so quotes are not exact and largely paraphrased. I’ve been a customer of 1-800-Contacts for quite some time but never had to call them for any reason. 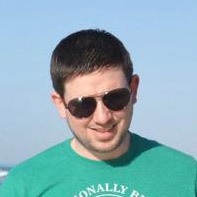 On my latest order, I accidentally switched the prescription for my left and right eyes. It didn’t really matter as far as the order went, but I didn’t want there to be any delay, so I gave them a call to have it corrected. The phone rang just once and then a recording started. Just a single ring and I had a cheerful, happy person on the line waiting to help. It was a short call — she added notes just to make sure there’d be no delay with the order — and that was that. Over a week passed and my contacts still hadn’t been delivered. I looked at the tracking info, and it showed DHL had dropped them off at the USPS hub for the final delivery, but the estimated delivery date was already two days past. I explained the order hadn’t made it yet. She asked if I’d mind waiting one more day. “Yeah, sure…” I thought to myself, knowing I’d have to end up calling again to get this taken care of. The next day rolls around and no contacts make it to my mailbox. At 12:05pm my phone rings. I don’t remember her name, but my best guess is Lindsay. The next day my new order of contacts show up and all is well. But we’re not done yet. Four days later, my original order finally shows up too. Knowing I’d get a happy person on the phone immediately and not sit on hold, I called them to let them know. Melissa, the rep who answered, sounded flabbergasted. Needless to say, I felt pretty good about myself. Sure, I could’ve kept them and saved $130 or so, and 1-800-Contacts had already written them off as lost. But knowing beforehand that getting ahold of someone and getting them returned would be hassle free, I didn’t hesitate to call. That, and I’m totally honest anyway. Really. 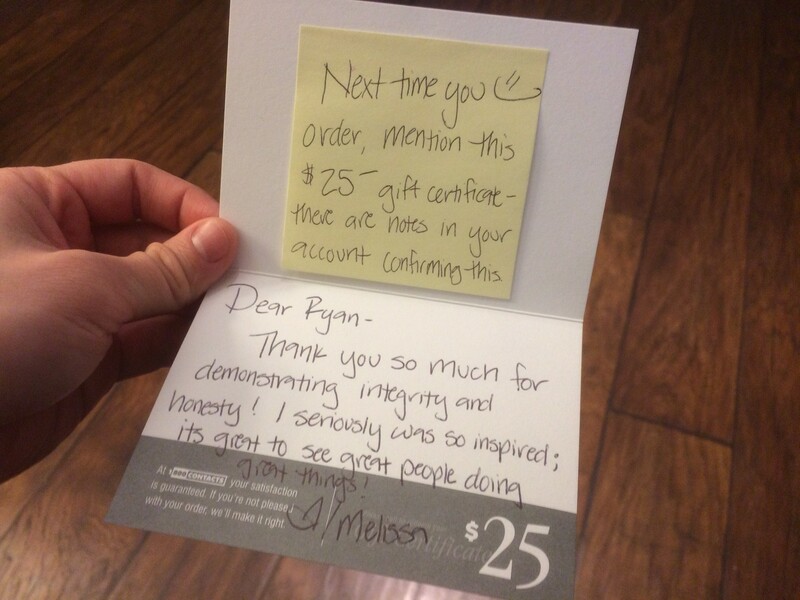 A couple weeks later I got a hand written note from Melissa in the mail, with a $25 gift certificate on my next order. Talk about the greatest customer service.